Dozens of the country’s artists have been invited to participate and interpret the theme, “REVOLUTION”, as a tribute to Andres Bonifacio on his 150th birth year anniversary. Dave Lock illustrates verses from the 98B COLLABoratory in these works of oil on canvas – all untitled, hence: Nameless. A self-described “optimistic nihilist,” Lock’s work is permeated by his realizations of “an extreme termination to all living and non-living things,” which move from hand to brush to canvas, in fine strokes that illustrate the artist’s careful avoidance of disillusion and depression. By using photography to highlight issues that are close to her heart, Kat Palasi’s The Last Pine Tree portrays the face of industry through a story of dispossession. In Palasi’s words, the people of Benguet province have become “disenfranchised by the many ‘development’ projects that have been imposed on them for many decades”. In Buenviaje, del Castillo’s central image is a cattle caravan usually seen peddling native handicrafts in the streets. Del Castillo brings the peddler caravan into the museum as a gesture of deconstruction — from its original form as a utilitarian icon into an objet d’art. Using the cattle caravan as a platform and a metaphor, he puts together the medium and technique that he had used in previous works (gold leaf relief-painting, metal build-up sculpture, assemblage of found objects and video). Buenviaje is hence del Castillo’s ode to a good voyage, the caravan and his art practice. The ‘buenas/good’ largely refers to a harmony of series of choices, events and conditions, rather than plain and simple good fortune. 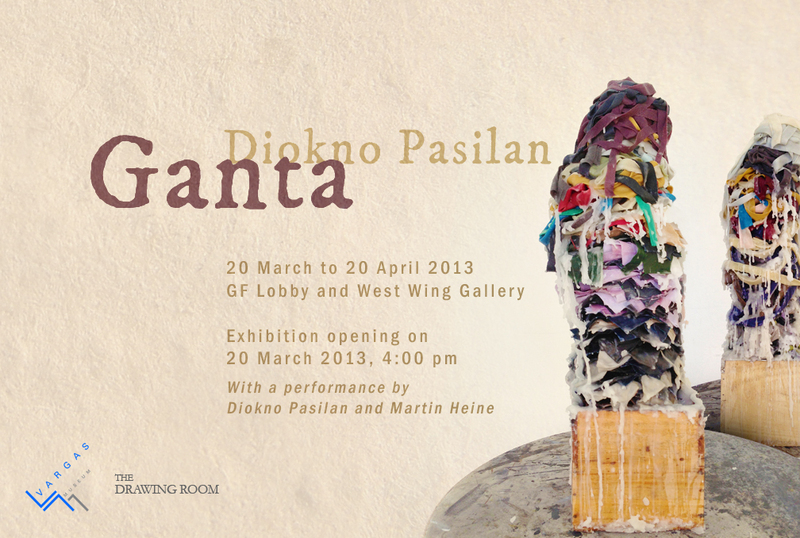 A word referring to an act of measuring or signifying a quantity, the title Ganta derives from Pasilan’s appropriation of a local device used to gauge the volume of grain. In this exhibition, the artist transforms the cube-like form of the gantangan into lightboxes evincing images of indigenous houses. These glowing cubes become modules arranged in an installation revealing the artist’s engagement with the material culture of various locales he inhabits. In Curiosities, Geraldine Javier explores the idea and process of collecting as a form of a human-object relationship. It focuses on the ties a collector creates with artifacts, relics and artworks Javier as an artist has collected, a condition that blurs the boundaries between collecting and art production. This relation is further illustrated in the juxtaposition of Madame A’s collection and Jorge Vargas’s memorabilia in the Museum. Their collections are representations of themselves as these objects play out as bearer of agency as construed by the artist. Walang Sinasanto embraces an entire range of allusions and references that straddle the realms of the mundane and the divine. It can denote the loss of sanctity, deeming no one or nothing sacred; it can also describe a condition where authority and hierarchy are challenged, or imply a condition of social and moral decadence. This set of meanings opens up a rich plane for discourse, which Garibay elaborates on his canvases. 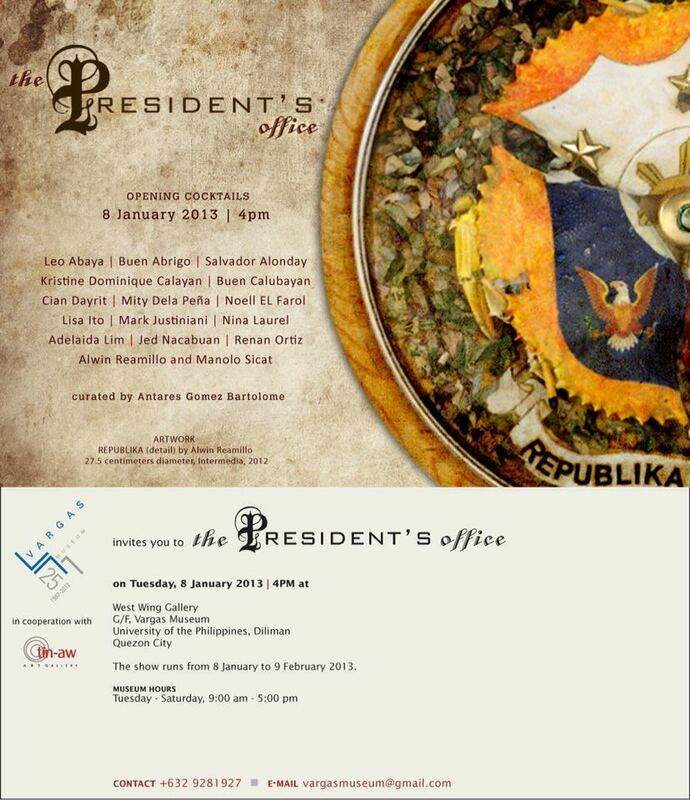 It is with consideration for this character of Malacañang as an imaginative blind spot that the participating artists took on the task of representing the Presidential Office. Their construction of the interior features and contents of the Presidential Office are informed by their perceptions of its functions, significations, and history. In turn, as representations that serve as reflections of their own imaginations, the works also function as indices of the expectations, fantasies, and perceived relationships that overlay our collective imaging of the seat of power. Comprising works in various media made by two generations of visual artists, Lupa: Struggle for Land weighs on the states of oppression and exploitation that the peasantry—the country’s most populous social sector—faces. 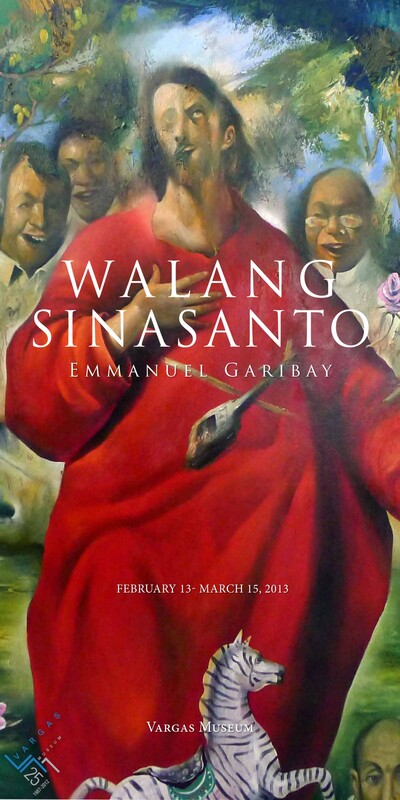 The exhibit looks back on the decades of landlessness, usury, land grabbing by both the colonial and native elite, natural resource plunder, and worsening poverty and their effects on society and the generations to come.